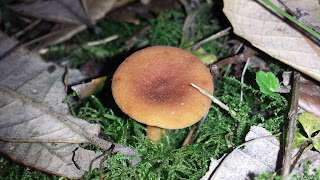 Lactarius fragilis, Lactarius camphoratus, and Lactarius rubidus are all commonly called "Candycap" mushrooms. These are the only mushrooms I've ever used to flavor cookies. They grow under oak trees in coastal California during the cooler months - at the coast they can occasionally be found year-round. One of the trails through our farm is named for them - the Candycap Trail. Last night, these tiny sources of joy made their seasonal appearance in our yard for the first time since the rains started three months ago! Definitely not a mushroom to start with - there are several toxic ones that look similar. 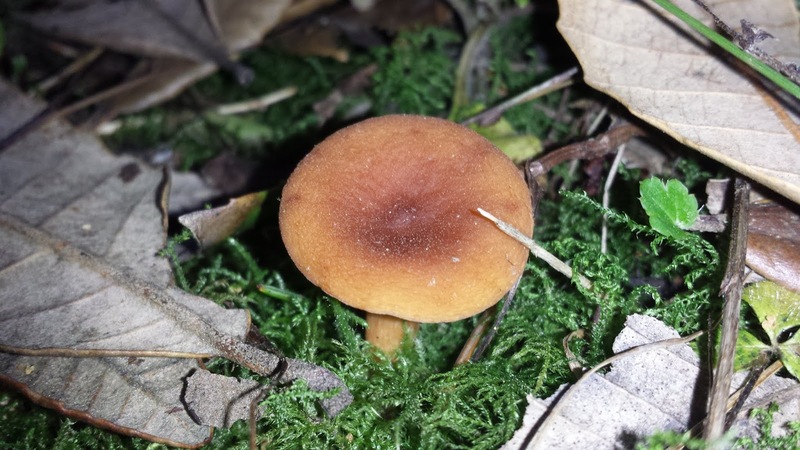 Go on a local foray led by a mycological society to get a proper introduction. David Arora's masterwork, Mushrooms Demystified, would be an excellent book to start with to get a sense of these tiny orange joys. If you pan fry fresh ones in hot oil until a bit crispy, they have a vaguely bacon-like flavor that works well in many dishes where bacon would be appreciated. If you dry them, the flavor and fragrance intensify. If you eat them, you will smell faintly of them for a few days - don't be surprised! We air dry them slowly (not in a dehydrator) to preserve the aroma, then powder them just before cooking. You can add the powder to any shortbread cookie recipe to impart a flavor that is very close to Maple Syrup. My son says "Come see Candycaps and find them with us. If you find some, we can come down and see what kind of candycaps you have found. Candycap trail is a good place to look. If you happen to find a puffball, we have to keep that. If you find a Butter Bolete they are good too. Thank you for reading our blog." Our property (less than 10 acres) often produces ten or twenty pounds of these over the course of the season, making them in some years our most abundant edible. If you live in the Bay Area, there are lots to be found and collected legally at Point Reyes Seashore (the trails leading away from the visitor's center are often good, though finding them depends on how many other folks went looking before you and whether they are even coming up).